No one knows why people get Chronic Acid Reflux disease. A hiatal hernia may contribute. A hiatal hernia occurs when the upper part of the stomach is above the diaphragm, the muscle wall that separates the stomach from the chest. 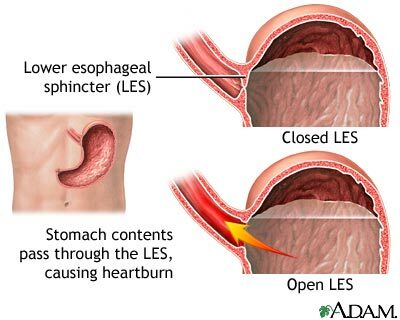 The diaphragm helps the LES keep acid from coming up into the esophagus. When a hiatal hernia is present, it is easier for the acid to come up. In this way, a hiatal hernia can cause reflux. A hiatal hernia can happen in people of any age; many otherwise healthy people over 50 have a small one.